Are you interested in becoming a member of our wholesale family? 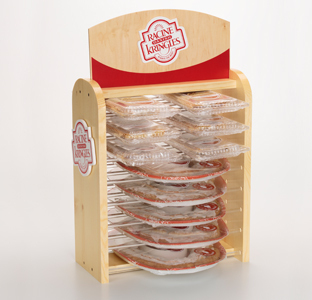 Our high-quality point of purchase wood displays are ideal for deli, bakery, and dairy departments. They are easy to assemble, lightweight and portable. 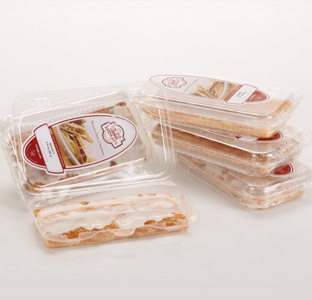 Our displays are easy to clean and maintain, making Kringle the perfect treat to increase your sales and maximize impulse buys. If you are interested in becoming a wholesale partner, please contact us at: 1-800-432-6474. Kringles have a frozen shelf life of 300 days and 5-7 days after thawing. Kringles come in a variety of retail packages. Our best sellers are 22 and 14 oz. Ovals, 10.5 oz. Sticks, and 3.5 oz. Single Serve Kringles. We have standard variety packs available, but we can also customize orders to fit your needs. All of our packaging is 100% recyclable! Are your Kringles delivered frozen? Yes, all of our wholesale products are delivered frozen. Are your Kringles trans-fat free? 99% of our products are currently trans-fat free. We are in the process of removing all trans-fats from our Kringle. Racine Danish Kringles are certified Wisconsin Kosher-Dairy by Kosher Supervisors of Wisconsin, LLC. 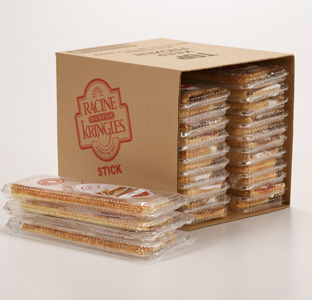 We are looking to sell Kringles in our store–can you deliver to us? We currently deliver to stores throughout Southeastern Wisconsin via our Direct Store Deliver program. We also sell through distributors across the country. Please contact us at 800-432-6474 for details. Which distributors sell your Kringle? We distribute our products through Piggly Wiggly Midwest, Lipari Foods, Valley Bakers, Certco, Sysco, SuperValu, KeHE, US Foods and many others. 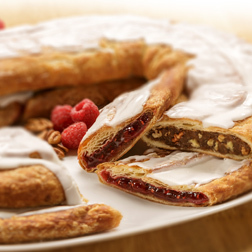 Call us at 800-432-6474 for more details on where you can purchase Racine Danish Kringles. What retailers sell your products? 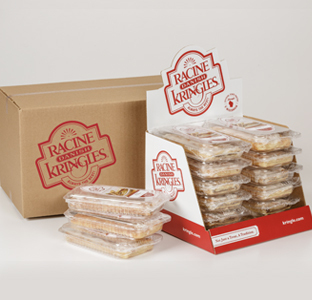 Racine Danish Kringles are sold in Pick N' Save, Meijer's, Piggly Wiggly, Woodman’s, Costco, Hy-Vee, Jewel Food Stores, Sendik’s and many specialty stores, just to name a few. How do you display your products? We offer a Merchandise Rack Program with durable and attractive displays that maximize product visibility and increase impulse sales. Many of our customers also choose to merchandise our Kringle on bakery tables or on end caps. How do you maintain the safety and quality of your products? We have a longstanding HACCP (Hazard Analysis and Critical Control Point) Plan, allergen control program, employee training, and numerous other food safety and quality programs. Along with monitoring by dedicated Quality Assurance staff, these programs and our facility are audited by a 3rd party on an annual basis to assure we are in compliance with current industry standards. Do you private label your Kringles? Private label is available for all our products. Please contact us so we can discuss how we can best suit your needs.